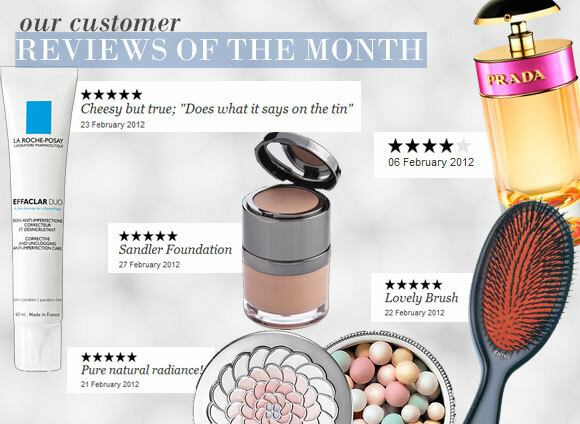 Below are our favourite reviews for February. Review are picked for being helpful, insightful or just really interesting. “Warm, rich, foody, comforting, soft, smooth, cosy fragrance with a touch of class! Prada Candy is a little bit bakery and a little bit plasticy. Like walking into a shoe store and someone eating a big cookie nearby. This fragrance really is exactly as the notes say, just a mixture of benzoin, musk and caramel. For me the benzoin note is the strongest note at the beginning of application, which dries down to a delicate musky base. Candy is not a sillage monster, nor is it a heavy fragrance. It stays close to the skin but I found the longevity to be very good! This is the sort of fragrance you would wear for the autumn and winter time as it has a certain ‘warmness’ to it. “I bought these guerlain meteorite pearls for a present for my mother’s birthday last month and they did not disappoint! I’ve been using the pearls for years to brighten up my complexion. The product has a slight shimmer to it and brings out a radiant glow on the cheeks and forehead. “If you take care applying, either with a sponge or brush you can create a dewy look which is more youthful than the powdery matt some foundations give. Blending it carefully is the key and takes a bit of practise getting the coverage just right, not too thick but not too thin either or you may as well get a tinted moisture. “To cut it short, I work in a kitchen. Smoke, grease, oil, dirt, whatever factor that can constitute the worse environment for skin you can imagine. And my skin flares up endlessly. Trying to predict a good skin day is nearly as hard as winning the lottery. “I bought this brush for my little girl last year and it’s so easy to use. The bristels are really gentle, but detangle the knots very effectively! The design is light and easy to hold. I deliberately bought the white nylon pocket brush because if it gets lost (in our home) it’s so easy to spot and find! This entry was posted on Wednesday, February 1st, 2012 at 4:03 pm and is filed under Reviews of the Month, Tried & Tested. You can follow any responses to this entry through the RSS 2.0 feed. You can skip to the end and leave a response. Pinging is currently not allowed.